So we finally made it to Nottingham on Friday, and after about an hour of slogging around in the rain, we finally found our way to the hotel we were staying at. We checked in, then, realising that David still had 40 Men at Arms, 18 Knights and a chicken Griffon to base, we went to watch the new Star Trek film. Wait, what? No, you did read that correctly, and it was awesome. Eventually, we got back and the basing began in earnest. I stayed up until 2AM before finally the energy drinks gave way to common sense and head met pillow in a glorious sleep-fuelled embrace. There was a fantastically hilarious moment when my alarm went off at 6.30, I sat up and stretched, and David suddenly bolted upright, awake, and yelled "OH CRAP! MY PLAN FAILED!" Apparently, he'd decided to get two hours of sleep, then wake up to finish his army... But he'd slept through the alarm. This it was that we arrived at Bugmans, worn, weary, but somehow still ready for battle (and breakfast). 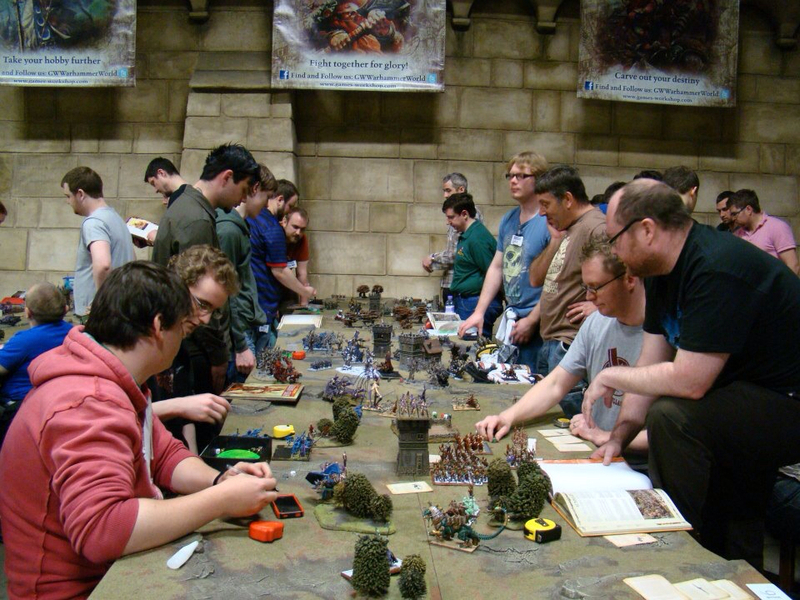 We handed in our beautiful army lists, designated ourselves as "Bring Me A Shrubbery" in reference to Monty Python, and moved to our first table and opponents. We'd written up a brief bit of backstory for our armies - uniting to fight a greater evil, and so decided that our games would follow a kind of story as the games went on. 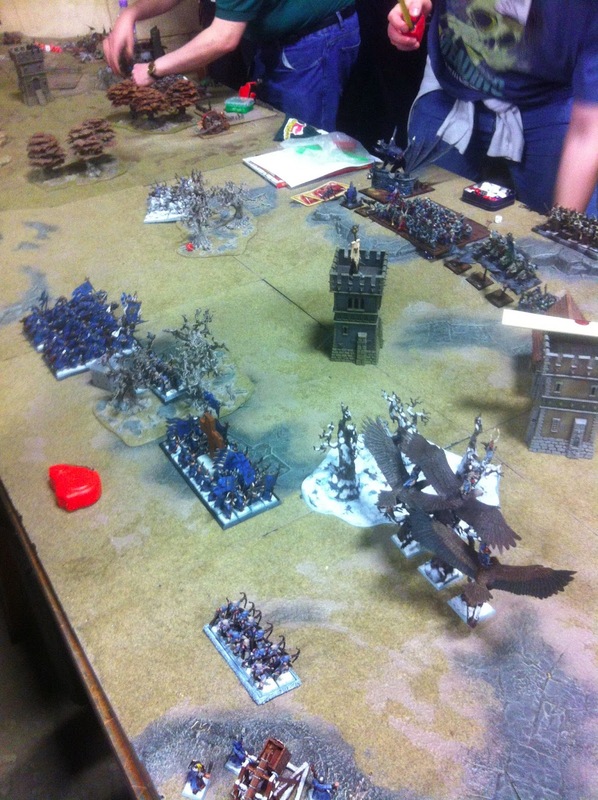 Our first game was the Watch Tower, up against a combination of Warriors of Chaos and Vampire Counts. Thus it was that the Brettonians, fuelled by their honour, diverted the host to a nearby village to try and wrest it from the clutches of the forces of darkness. 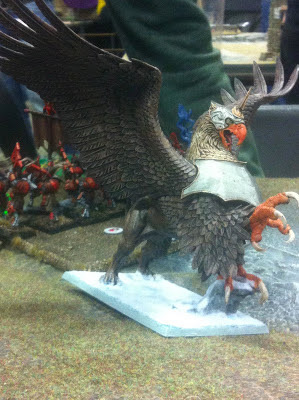 On turn one, a Terrorgheist flapped its way to our side of the battlefield, and screamed unholy fury at my Glade Riders. Three of them dropped dead in fear, but the survivors, coupled with a lucky trebuchet shot, pulled the beast down in vengeance. David's Knights Errant got utterly bogged down in a mire of zombies that the just couldn't kill enough of, and both units ended up being brain-meat for the undead hordes. Even his Paladin, mighty and virtuous though he may think he be, managed to only draw blood on the Vampire general, before being summarily cut down. Even the might of David's trebuchets only managed to be Juggernaut bait for the Chaos armies Skullcrushers, the crews being torn apart and their skulls harvested for Khorne; and my Warhawk Riders managed to do absolutely nothing to the Chaos Sorcerer skulking in a nearby building, instead choosing to smash, pigeon-like, into the windows. Thus it was that our host limped away from the battle. Besides the three Glade Riders, my army remained untouched, and although the forces of darkness had taken an utter beating, they still controlled the Watchtower and so remained victorious, though only just. After a brief discussion between the Wood Elf Highborn and the Brettonian Paladin about the correct applications of force (and the Brettonian complaining that a general should stay close to grant his troops valuable leadership rather than running around the board peppering and harassing units), we moved to table two. Leaving the poor village behind them, the Wood Elf and Brettonian host arrived at a pass through the mountains, and there before them lay a daunting array of more Chaos Warriors, this time supported by vile bray-herds of Beastmen. It was a Battle for the Pass, and it did not go well from the outset. The Beastman general was none other than Slugtongue, and his horrific abilities utterly decimated our forces before the game even began. He has a rule that means every enemy unit within 36" of him has a chance of taking unsaveable wounds due to his corrupting influence. Several Glade Guard, two of the Warhawk Riders and the Wood Elf Highborn were taken out before the armies had even begun moving, and such a wanton display of destruction demoralised enough of the army that we were down to about half strength before the battle had even started. The rest of the battle was an utter travesty. The vast majority of the army refused to rally and fled the battle, the Knights Errant fumbled their charges and the trebuchets were wildly inaccurate. The Knights were summarily cut down by another unit of Skullcrushers, and a horde of Slaaneshi Forsaken tore their way through the eastern flanks. The Brettonian Damsel made a valiant display, turning herself into a multi-headed Griffon (Transformation of Kadon: Hydra) in an effort to take some of the enemy with her, but Slugtongue proceeded to then drop her into a Pit of Shades when she failed her initiative test at now Initiative 1. All in all, game two had left us utterly decimated. A measly 215 victory points being our only reward against a 2150 victory point loss. The third battle was a more traditional battle line. Beyond the pass, the host encountered yet more Warriors of Chaos ("Oh look, David! Skullcrushers! "), though this time, an ogre tribe had descended from the mountains to aid them. In the first turn, the Glade Riders took a full strength Fireball to the face after David cunningly decided to not attempt a dispel. "Don't worry, as long as one survives and rallies, you can hide it behind the tower and not give victory points." One cataclysmic pyroblast later, and David realised they'd used all their magic dice to cast it - they'd taken the hit for no good reason. The rest of the battle saw a continual to-and-fro of dominance, neither side truly willing to commit their force and end up bogged down with exposed flanks. Mournfang Cavalry attempted to control the eastern flank, but were torn apart by a daring charge from the Knights Errant, before being claimed in turn in the name of Khorne by the Skullcrushers unit. Our friends who'd come with us hadn't faired much better than us. 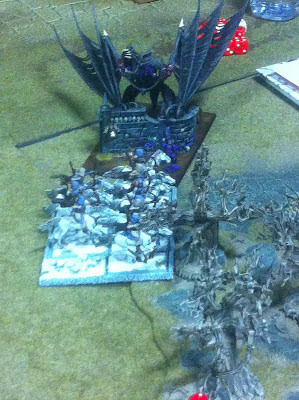 Faye and Fox had also lost all their games with their Vampire Counts / Skaven combo. Fox, naturally, claimed his Skaven had been sabotaged, until Faye pointed out that the Desperate Alliance rules had meant that Fox had been stealing all her power dice every game, stopping her from casting much needed Invocation of Nehek spells. Ivan and Kit, with their High Elf / Dwarf combo had faced similar trials. Their first game had taught them a valuable lesson on how painful Hellblaster Volley Guns can be, though Ivan had discovered a new found love for his Flamespyre Phoenix, and was pleasantly surprised at the first games he'd played with the new Army Book (which had been released literally a week before the tournament). With the moon high in the sky, our bellies full and our tankards empty, we finally made the journey back to the hotel to rest up in preparation for the second day.